Anita Moorjani 'died and came back to life'. 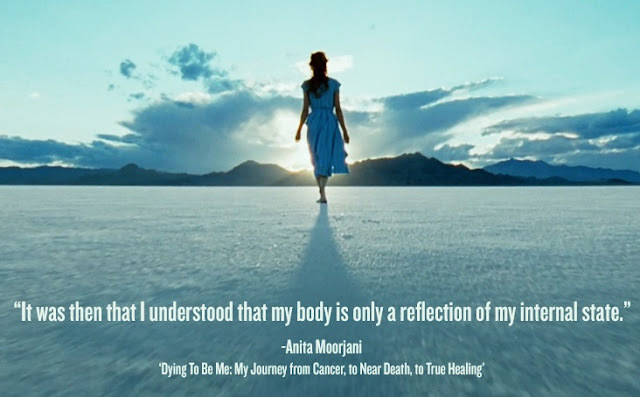 Anita Moorjani asserts that her cancer was caused by her emotional state. "In 2006, after suffering cancer for almost four years, Anita's organs started shutting down and she slipped into a deep coma, for 30 hours. Anita told her family that during her NDE, she had been greeted by her deceased father and deceased best friend, who had told her that it was not her time to die. Moorjani said she had a strong reluctance to return to her suffering and dying physical body, but was encouraged to return by her father and best friend who told her that she needed to return and to "live her life fearlessly". 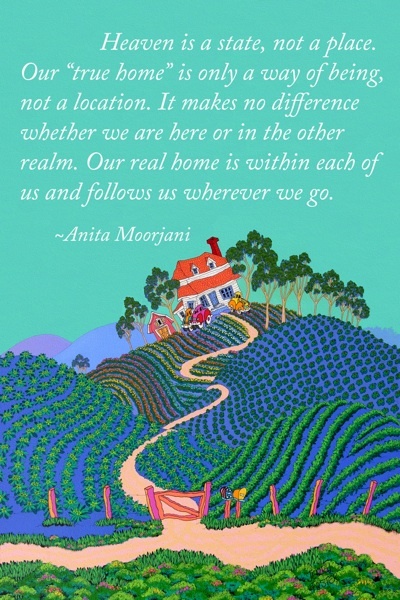 Within weeks of her NDE, Anita was cancer free. "It’s actually the opposite of focusing or choosing … it’s almost like a release, like a letting go, like a surrender … so there is no goal or anything … it’s like any sense of wanting to attain anything has to be released. "Once I do that … it feels as though I have access to the infinity, to the higher, to the unlimited, to the potential, to the ambiguity. "The minute you put limitations on it, ANY kind of limitation, even the limitation of ‘this is the state I want’, you are limiting the possibility. It really means opening yourself up to absolutely anything … with NO expectations, and you become available to everything, absolutely everything."